U.S. Patent #3960325 Our unique in-line heat exchange unit warms cold material as it is pressure-pumped from your material pump to the roof. Eliminates torching or overheating of material without thinning or diluting with solvents. May be used with any air or hydraulically powered pump. Has 55 gallon heat transfer oil capacity. Comes with Hi-Lo Semi-Automatic Control System and 25' LPG hose assembly with regulator assembly as standard equipment. Application: The WarmMaster is an in-line heat exchanger that warms cold process material and/or other fluids that are pressurized and pumped. It should be used: 1) For petroleum-based materials ONLY, no water-based materials 2) Whenever material temperatures drop below the manufacturer's recommended temps 3) When fibrous or highly viscous material is being pumped 4) When hose runs exceed 100 feet: Material may be pumped directly from pails, drums or tanks eliminating the need to dump or drain material into vats or the necessity of trying to heat materials with a hand torch, pail or drum heaters or other unsafe or inefficient methods. Features: Thermostatically controlled vat temperature No thinning or diluting of materials Fast & efficient Use with any pressure material pump Use with long hose runs over 100 feet Increases speed of application & extends spraying season Use your existing equipment, do not have to purchase a new pump Over 55' of finned tubing in coil unit (heat exchanger). Patented finned tube design is equal to over 300' of standard tubing. 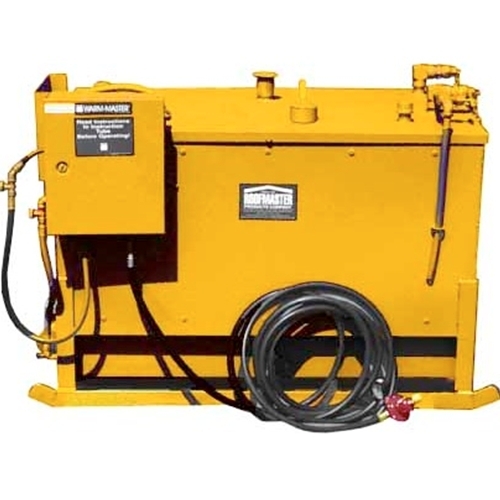 Note: This unit comes complete with 55 gallons of heat transfer oil.